Diana Penty was wearing a sleeveless cream Tarun tahiliani’s outfit during the Kapil Sharma Show on Sony TV. She looks pretty in any dress due to her height and marvelous figure. She wore silver earrings to ensemble the dress with bun style hair. 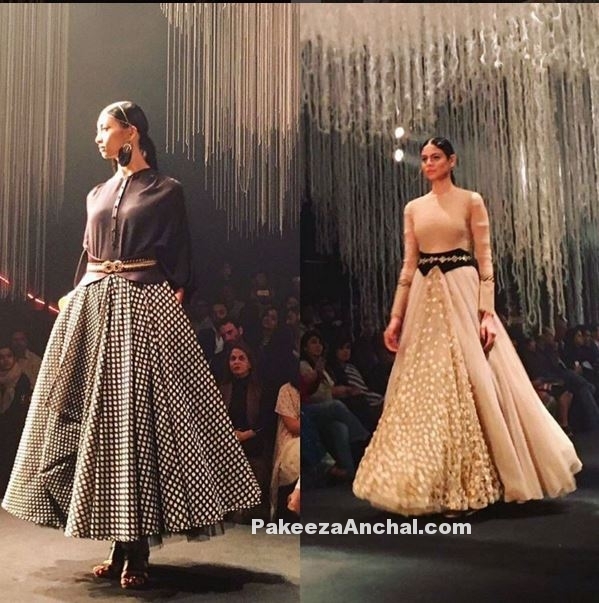 2016 is on the way and Tarun Tahiliani is back with his set of creation with the Spring Summer Collection 2016 with fabulous and gorgeous fabrics and stunning beautiful models in one of the best designer dresses on the fashion ramp. With Varied colors of grey to orange and white making it feel to beat the summer hitting this season. Katrina Kaif and Aditya Roy Kapoor were the show stoppers on the ramp. Katrina was wearing a White Saree and sleeveless transparent blouse with Pearl Waistbelt. 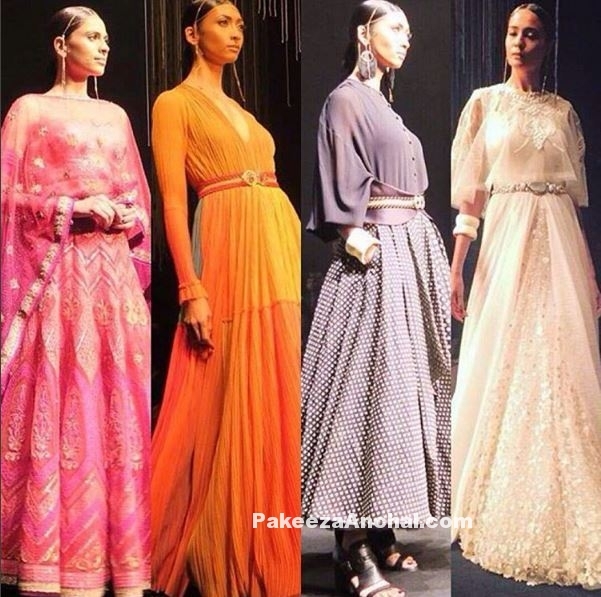 Have a look at the Latest collection of Tarun Tahiliani’s Spring Summer Collection 2016. Katrina Kaif walks on the ramp in Tarun Tahiliani’s white Saree featuring pearl work across the border and a transparent sleeveless Blouse with embellished pearl work and a waist belt made of pearls as Kamarbandh. Bollywood Actress Madhuri Dixit (Nene) looked gorgeous wearing Tarun Tahiliani Golden Lehenga Saree with a Shimmering Pallu and a matching Velvet round neck Backless Blouse on the red carpet during the Marrakech film festival 2015. 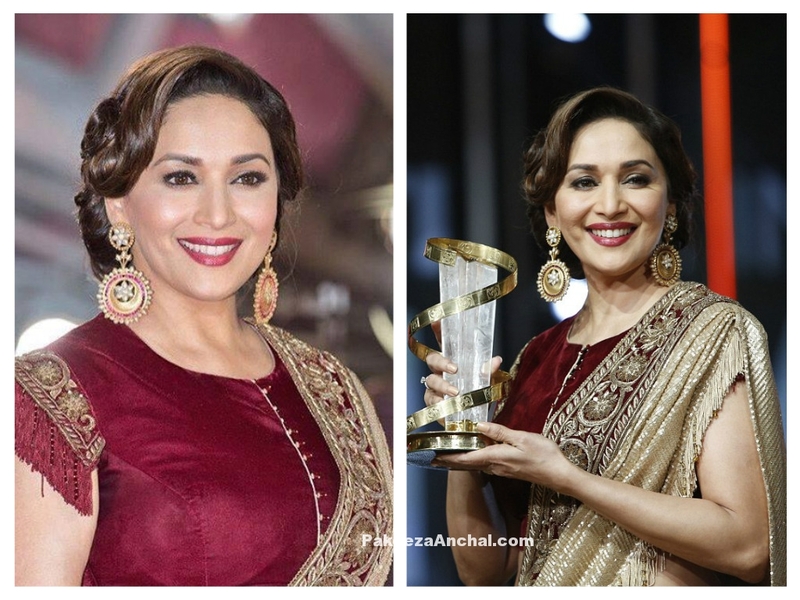 Madhuri Dixit walked on the red carpet at the Marrakech film festival in a Tarun Tahiliani Lehenga saree. 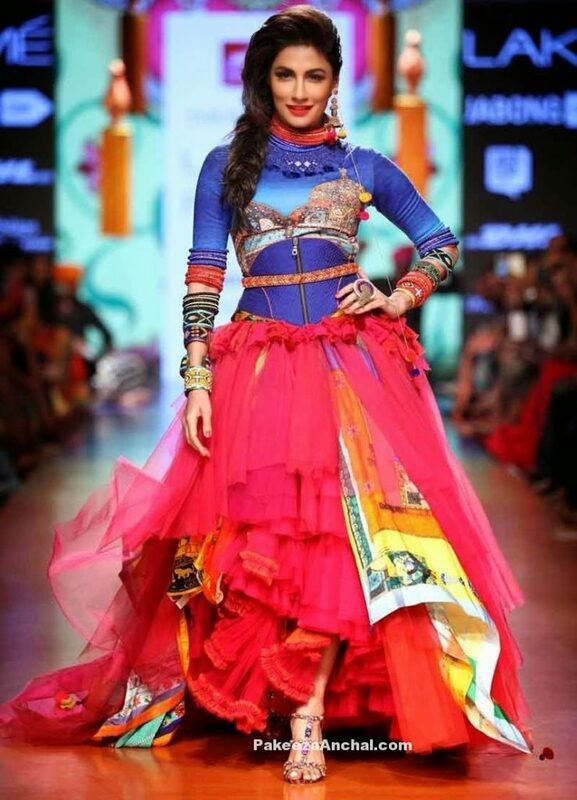 Chitrangada Singh was the show stopper at Lakme Fashion Week, who walked on the ramp for Tarun Tahiliani in colorful dress like it as just painted out by Tarun Tahiliani. 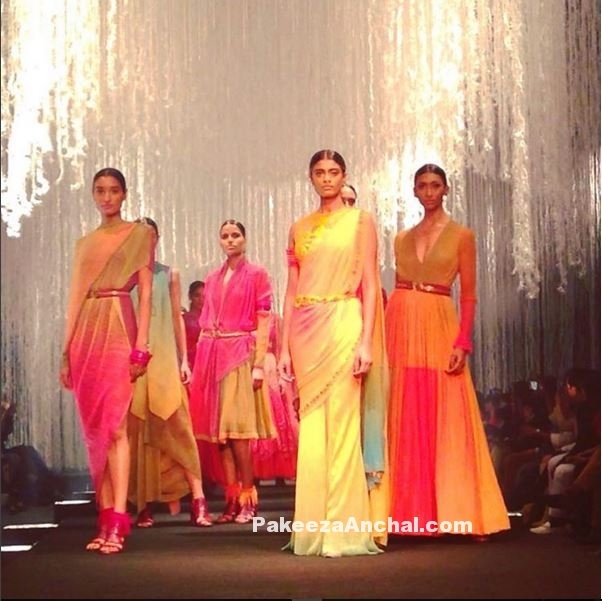 She looked awesome in the Blue, Pinkish Orange artistic colored dress at the Lakme Fashion Week Summer Resorts 2015. Lisa Haydon wearing a Off Shoulder Lehenga Choli design embellished gold zardosi work across the Lehenga and Choli. Paired with a matching Dupatta with Zardosi work designed by Tarun Tahiliani during the BMW India Fashion Week 2015. 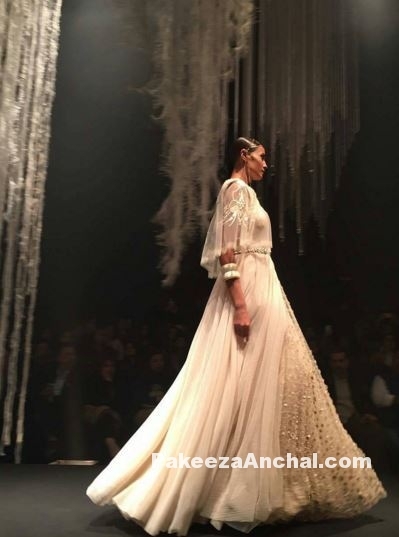 Lisa Haydon was the show stopper with her fashionable Lehenga Choli dress on the ramp. Madhuri Dixit Nene was attending the most popular dance show on television ‘Jhalak Dikhhla Jaa season 8 – A Celebrity dance reality show’ for few years now. She was seen in a Tarun Tahiliani’s Red Chiffon Saree with Off Shoulder/One Shoulder Blouse beautifully draped over her navel. Kareena Kapoor in White Long Frock Anarkali Churidar dress with transparent full sleeved dress with lace designed by Tarun Tahiliani. Neckline of the dress seems to catch attention with silver zari work on it lucknowi work on it. Kareena kapoor looked gorgeous and elegant attending the UNICEF Programme in Delhi with her hair pulled back in a bun.